Frankly speaking, I am extremely disappointed with the financial performance of Asian Pay TV Trust (“APTT”) for Q2. Disappointing as in the ARPU has not stabilized at all as per asserted by APTT management for many prior quarters. Q2 2018 saw further decline instead of “stability” in the key performance indicator of all its business segments. 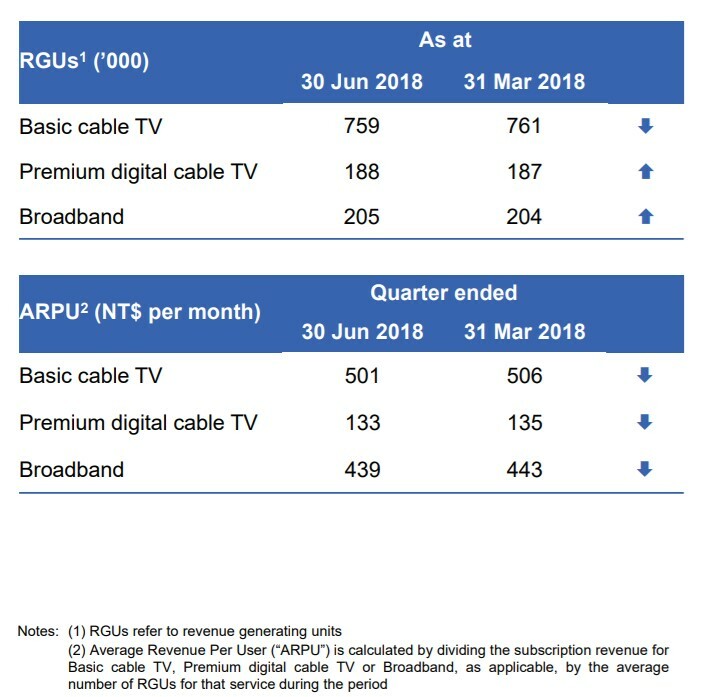 I have previously posted that in the absence of visibility of earnings upgrade from the ARPU, I will not put in more investment into APTT due to the intense competition disrupting its business. APTT is clearly facing tremendous competition from pirated Android TV boxes, Netflix and other online video streaming medium-IPTV. The piracy issue is not just a Taiwanese issue. This is a global problem. In Singapore, Starhub is a very good example of another pay TV business that is seeing declining subscription from the rampant piracy issues. I am sure many of you all know of some colleagues/friends or relatives who have purchased those “TV boxes” from Sim Lim Square and then decided to cancel the monthly subscription to Singtel and Starhub pay TV services due to the super cheap cost. So far, the content pirates are still outwitting authorities & pay TV companies and proved almost impossible to shut them down. In addition, APTT is also besieged by unlimited wireless data packages from mobile operators on the Broadband front. The availability of low cost unlimited data offerings from top Taiwanese mobile operators means that APTT is forced to offer higher speeds at competitive prices to acquire new RGUs and re-contracting existing RGUs. The CAPEX invested over the past few years for growth purpose turns out to be more of a defensive CAPEX nature in order to address the decline in broadband subscription over the past few years. APTT senior management gave reassurance to all investors during the Q2 results presentation by pointing to the assertion that “With a stable and resilient cashflow, APTT is a defensive business that is positioned to grow in a measured way”. (4) Premium Digitial TV. Room for growth as digital cable TV penetration in Taiwan is still lower than that of Korea, Singapore and Hong Kong. The management team has mentioned that APTT is exploring potential unit buybacks as the current unit price of APTT is undervalued. At the same time, it wanted to strengthen its balance sheet hence as a result, the Board of directors is of the view that the distribution per unit in 2019 is likely to be lowered to support the initiatives. I find it incredulous that at this juncture, the management team feels strongly that APTT is undervalued by the market. A declining service pricing and uncertain future market outlook (declining historical track record since IPO) can also mean that the business activities will continue to worsen. I will not be surprised given the upcoming super fast 5G mobile network roll out and also unresolved rampant piracy issues. APTT is already warning investors that the overall performance of FY2018 will be worse off than FY2017. The cutting of future 2019 dividends in a way seems to be an admittance that the historical business model of leveraging heavily from bank borrowings is no longer sustainable in view of the competitive operating environment. Using the dividend discount model and assuming dividend is cut by 50% due to lower cashflow and to fund CAPEX, the price may drop to S$0.216 per unit once it is announced officially in Q4 with regard to the slashing of dividends. I do not think investors will accept a cost of equity lower than 15% for holding on to APTT unless the business outlook and revenue generation improved drastically. I am thus unsure why the management choose to want to cut dividends instead of continuing to utilize cheaper bank borrowing at effective interest rate of a mere 3.4%…..unless despite all the positives painted in the presentations, they have no confidence and are in fact very worried over the declining APTT business and worsening cash flow generation. But I reckon that APTT management team is probably really just being prudent in its new approach and I am just thinking too much?